FCFA is training African scientists in new skills and methodologies to study the African climate. Oumar Konte participated in a week-long training workshop on climate modelling at the University of Leeds, organised by the Africa Monsoon Multidisciplinary Analysis 2050 (AMMA-2050) project in December 2016. 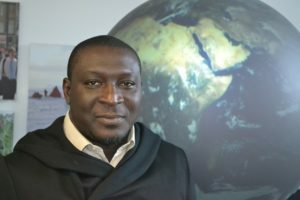 Oumar Konte’s daily work in Senegal is about giving farmers useful climate information: to help them make the wisest decisions possible to secure their food and livelihood security. He chose agro-meteorology as a career because – he said– “it is a branch of study where you can help farmers”. It is vital to a country where most of the active population is farmers. Because farmers face a great deal of variability in weather and climate conditions from one year to the next, they rely on the government’s forecasts to guide their planting times, crop selection and use of fertiliser. “They want to know when the season will be beginning, if they are going to have good rain or not. And for this we have a lot of projects,” said Dr Konte. His office in ANACIM trains farmers on the nature of climate change and what its implications are for the agricultural environment. Dr Konte’s team produces short-term, seasonal and other forecasts and trains farmers how to use them. SMS text campaigns and rural radio stations help spread the word, when it’s needed. As part of the African Monsoon Multidisciplinary Analysis 2050 (AMMA-2050) project, supported by the Future Climate for Africa programme, Dr Konte and colleagues will be gathering and analysing a great deal more data about rainfall and temperatures in the west Africa region. Dr Konte took part in training in Leeds, UK last week, learning a new computer script called Python that he will be able to apply to various climate modelling packages. See the other profiles of FCFA-funded early career researchers. Image: Oumar Konte, courtesy Mairi Dupar, FCFA.